Visitors to the British Virgin Islands may wish to spend their entire holiday on the island on which they are staying, or they may prefer to travel to other islands.Most resorts offer a range of activities both on the island and in the surrounding area including fishing excursions and island tours. As the BVI's offer one of the most spectacular cruising grounds in the world, one of the primary activities here is sailing - with reliable trade winds, short easy passages and perfect anchorages, the region is a mecca for yachtsmen. There are numerous yachts available for charter, by the day or by the week, either bareboat (ie without crew) or fully catered and crewed. - Diving and snorkelling. There are over 100 recognised dive sites over reefs and cays, offering excellent opportunities to discover the underwater world . Most hotels and charter yachts have snorkel equipment available for hire, but if you are a keen snorkeller we recommend that you take your own equipment. There are numerous dive operators, many of which will rendezvous with you at your yacht or hotel. 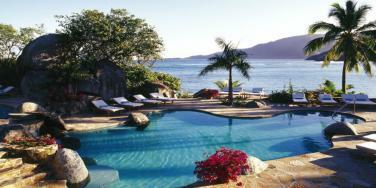 - Other water sports including windsurfing and kitesurfing. - Fishing in one of the many excellent spots around the British Virgin Islands, where plenty of deep sea fishing trips are available. - Boat trips to other islands, either one of the four main islands (Tortola, Virgin Gorda, Anegada and Jost Van Dyke) or one of the 50 plus smaller islands and cays, only 15 of which are inhabited. Visit Tortola, capital of the BVI where history and culture can be found; Virgin Gorda, a beautiful island with protected national parks; the large yet peaceful Anegada which is known for the fine lobster; Jost Van Dyke. 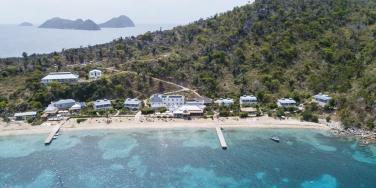 a small island where exceptional cuisine can be found; or another island with pristine beaches and rich vegetation. - Excursions to the cosmopolitan US Virgin Islands where visitors will find duty-free shopping, fine dining and a championship golf course. Please note British citizens will need a visa unless they have authorisation through the ESTA to travel to the United States under the Visa Waiver Program - application should be made at least 72 hours prior to travel to the US Virgin Islands. See ‘When to go’ for more information about local events. The Baths (Virgin Gorda): One of the most popular attractions in the BVI where visitors can swim and snorkel in the natural pools and grottoes created by giant boulders in the sea. RMS Rhone National Marine Park: dive site just off the coast of Salt Island where a wreck is now encrusted with coral and provides shelter for a variety of tropical fish. Anegada: The only coral island in the British Virgin Islands which is surrounded by a reef, offering white sand beaches with piles of conch shells, outstanding snorkelling opportunities including Horseshoe Reef, salt ponds with flocks of pink flamingoes, and the finest lobster you will ever eat. The Bubbly Pool (Jost Van Dyke): A tidal pool which is similar to a natural Jacuzzi when the wave conditions are right. Sage Mountain National Park (Tortola): A forested area covering the highest peak in the BVI where visitors can watch tropical birds and enjoy stunning views as they hike along the trails. 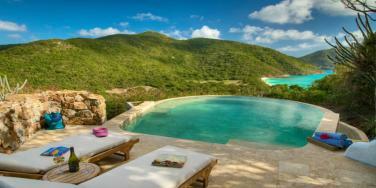 Smugglers Cove (Tortola): One of the most idyllic beaches in the archipelago with calm waters and a white sand beach. Deadman’s Bay (Peter Island): A pristine beach which is a great spot to swim, take part in water sports and enjoy lunch. The British Virgin Islands are full of gastronomic delights, offering the opportunity to enjoy authentic dishes while mingling with locals, or dine on gourmet cuisine in sophisticated surroundings. Local specialities include Fungi, a cornmeal-based dish which is often served with Kallaloo, a thick stew made with spinach, okra and local greens. The lobster on Anegada is renowned, with an annual festival being held on the island in November to celebrate the delicacy. 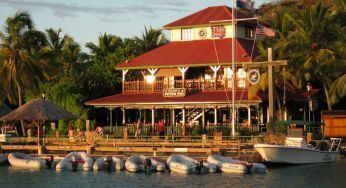 Many of the most renowned gourmet restaurants in the BVI are found within private island resorts such as Guana Island, or in waterside settings such as Bitter End Yacht Club on Virgin Gorda and The Moorings Marina on Tortola. More casual dining options include Hog Heaven on Virgin Gorda and The Big Bamboo on Anegada. Some of the best drinking spots are found on Jost Van Dyke and include Soggy Dollar Bar, a beachfront bar where the most fun way is to arrive by boat then swim ashore, and Foxy’s Bar & Restaurant where visitors are entertained by the guitar-playing owner. 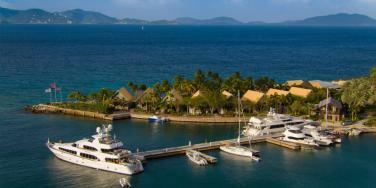 See ‘best places to eat on the British Virgin Islands’ for more information.